Multiple visits to Pondicherry Cafe over past year have confirmed that these guys are absolutely fantastic and easily my favorite buffet destination in Mumbai. This time, it is to review their Magic of Malaysia i.e. Malaysian Food Festival. Kudos to them for such exotic food festivals that help us acquaint with unique global specialty cuisines. Chefs Hamedy & Syamsyul have brought authentic Malaysian dishes and the experience of feasting on them is made better by the traditional dance performances by Malaysian dance troupe. Check out this food festival till 4th March 2018. Walk in on the ground floor of the luxurious Sofitel at BKC, enter the plush Pondicherry Cafe through 'Petronas Towers' and take a moment to soak in the ambiance. Brightly lit environs, rich colors all around, beautiful view from the french windows, an array of food counters, including a special Malaysian set-up to welcome us all. Mostly look forward to fresh seafood and enchanting flavors of coconut, tamarind, chilli, soy sauce etc. Non-vegetarians seem to have more options than vegetarians so a little bit more variety of dishes would be appreciated. But actually this is expected because Malaysian cuisine does not have a naturally large swathe of veg dishes. Here they have at least brought 4-5 veg dishes for us which gives a decent look at their food preparation techniques. I really liked everything I tried since the flavors are not overpowering the core ingredients and seem simple but linger long on the taste-buds. They are also changing the menu a little bit everyday to include as diverse roster of Malaysian dishes as possible. Starting off, VEGETABLE CLEAR SOUP was just perfect with its warmth and wholesomeness of corn, cauliflower and broccoli in a mildly tangy broth. KWAY TEOW GORENG - Malaysian Fried Noodles, absolutely lovely, Flat Noodles stir fried with Veggies and Soya Sauce, I added a little bit of sweet chilli + vinegar and it was exploding with flavors. Had 2 rounds of these. BUBUR KACANG MERAH- Red Beans Porridge made with coconut milk and palm sugar (this one reminded me of Gud ki Kheer made by nani), another authentic Malaysian dessert that I was happy to taste. ROJAK BUAH BUAHAN - Fruit Salad, this one was surprising. We are used to having fruits slathered with milkmaid or honey as dessert. Here we had assorted fruits getting a spicy + mildly tangy kick with sweet soy dressing! Never had anything like this before, glad to have tried this very unique flavor. Non veggies had a lot more to feast on. 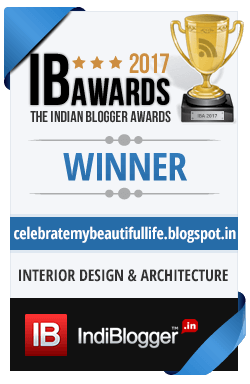 Apart from all this, for those who want to stick to tried & tested/conventional fare, in Indian, Continental sections, this buffet has plenty of options for them. They also have SUSHI, DIMSUM, HUMMUS but honestly this time I did not find them any great. Veg Sushi was extremely dry, they ran out of Dimsums very soon and the solitary piece I had was not good (very thick exterior). I stuck to Indian dishes and my mom also agrees that they have very tempting and delicious Indian food spread, it has consistently been flawless. Not to forget UNLIMITED LONDON DAIRY ICE-CREAMS! Especially love Praline & Cream and Mango Sorbet. 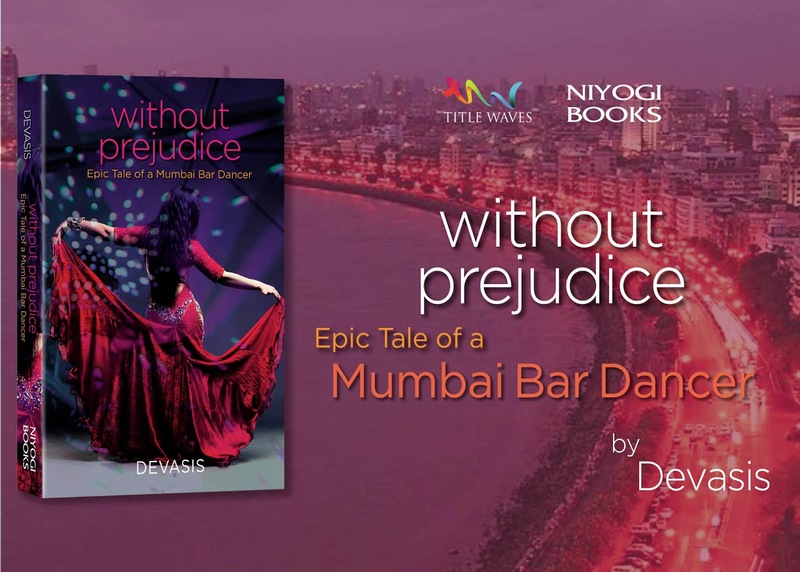 Whitening is a controversial subject matter in India. Well, for me, whitening is more of a brightening effect where skin becomes less pigmented, more even-toned, less tanned. For this effect, I have tried many products as I do need even-toned skin having never used sunscreen all through my school and college years! 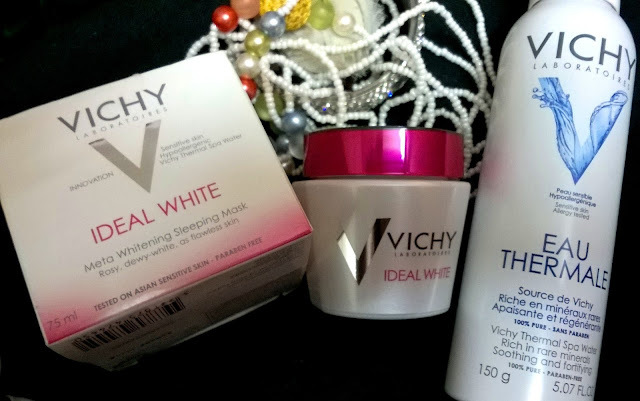 Vichy Ideal White Meta Whitening Sleeping Pack is what I tried recently on my dry, sensitive, acne-prone, uneven toned skin. Vichy is famed for using minerals-rich spring water in its products that deliver a host of benefits to skin. So I was pretty excited to use this product. Ingredients list contains a host of chemicals and I was actually scared looking at that, trying to pick out natural ingredients and then I gave up. Packaging is simple and cute but the jar does not seem travel friendly since it is made of glass. Claims include revealing rosy, dewy-white, flawless skin; skin would be moisturized, even-toned, healthy and it is even suited to sensitive skin. 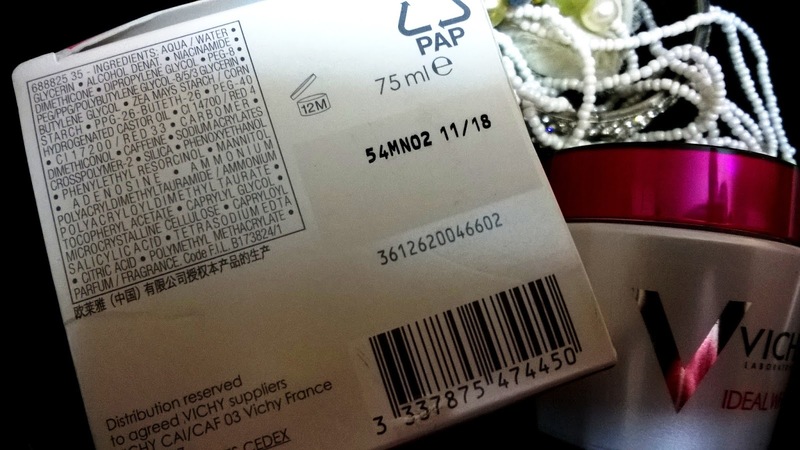 Quantity is very good and it lasts 2 months even if used everyday since only a little amount is needed every time. My sister bought it for me from Amazon for around Rs. 4000 and it is definitely a very expensive product since it is a world renowned luxury brand. The first time I opened the jar, I loved the look of the mask. 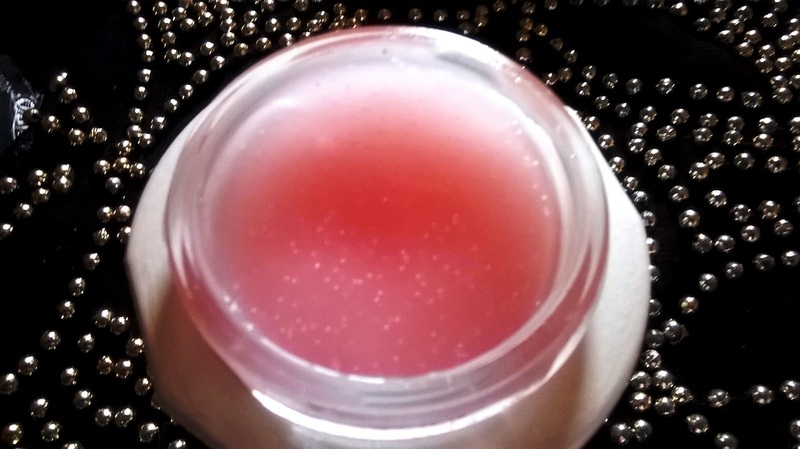 It is a pretty pink color with beads in it which start melting when applied on face and then get absorbed with the pink cool gel. It feels light and I did a little massage every time I applied it. It did not give any adverse reaction on my complicated and sensitive skin. It felt a bit greasy so I was afraid of allergic reaction. But no redness, no rashes, no sensitivity, no acne at all! But still, I did not like to keep it on my face throughout the night so I washed it after 3 hours and that way it did not do much on my skin. Then I started applying it as a mask for longer hours (around 6-7 hours) and then washed it off and then went to sleep to wake up to plumped up skin. Skin feels softer, smoother and there is a nice glow on skin too. But NO WHITENING! 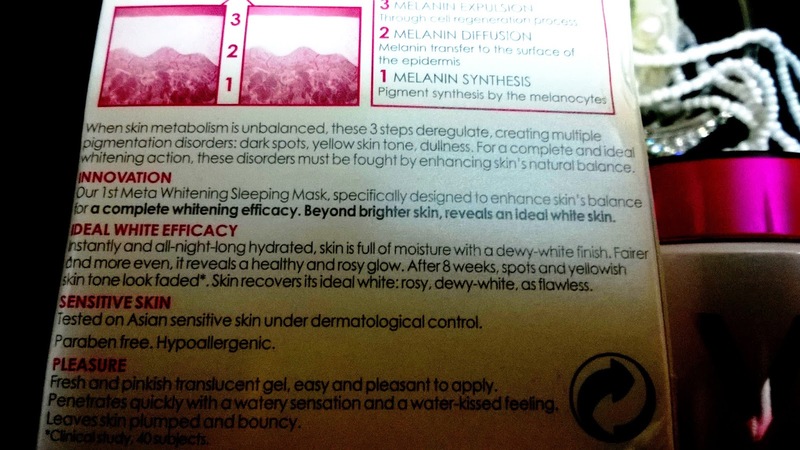 After all the claims about it being a whitening pack, I expected dramatic decrease in my pigmentation on chin and forehead especially but to no avail. It was a good face pack otherwise but not at all for whitening. Recommended- YES and NO. Yes if you want a good face pack for softer, smoother, refined, plumped up skin. NO if you want whitening. Rating is 3.5/5. 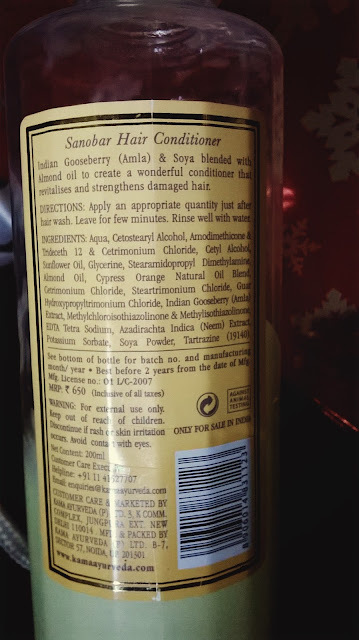 Having been blessed with dry as straw hair that is also damage prone, dandruff prone and extra frizzy, it is my distinct pleasure to find something useful for my hair i.e. moisturize it, make it frizz free and not increase dandruff or itchiness on my scalp. 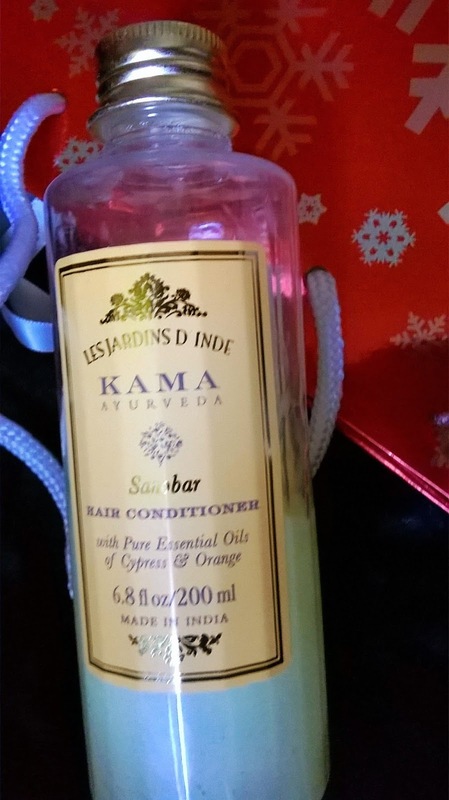 The latest in this quest is Kama Ayurveda Sanobar Hair Conditioner with Pure Essential Oils of Cypress and Orange. Kama Ayurveda is one of India's premium Ayurvedic beauty brands with natural ingredients. Kama Ayurveda Sanobar Hair Conditioner has Pure essential oils Cypress and Rose as its major Ingredients along with Almond oil, Amla and Soya. Packaging is elegant and travel friendly. Claims include strengthening and revitalizing damaged hair. Quantity is enough to last a month if used thrice a week. I bought it from Amazon for Rs. 650 for 200 ml and it is not at all expensive considering the quantity or quality of the product. My hair is excessively dry and frizzy. On using it, my hair did not feel heavy or weighed down at all which could be because it has more natural ingredients whereas most other conditioners are full of chemicals. It did make my hair smooth for very small time and it was frizzy and dry again after 24 hours. I did not see much hairfall either, hair felt a bit better behaved for 24-48 hours. This would be really good for normal dry hair whereas for my kind of hair, I need heavy duty hair spa creams most of the time to make it behave more permanently. Recommended - YES for normal dry hair. For extra dry and frizzy hair something much more intensive is needed. Rating is 4/5. For skin as dry as mine, using as many different lotions and creams as possible is a given, especially during winter months since no single lotion seems to be able to do the perfect job. And it cannot be too greasy or there will be pimples galore on my face, and it cannot be too light or my parched skin will stay like a desert. 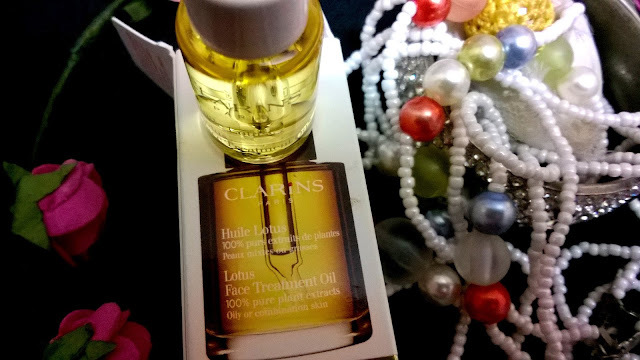 So on this quest to find a product that would soothe and moisturize my facial skin without making its sensitive side flare up, I ended up buying Clarins Lotus Face Treatment Oil for a trial. Let us see how it fared! 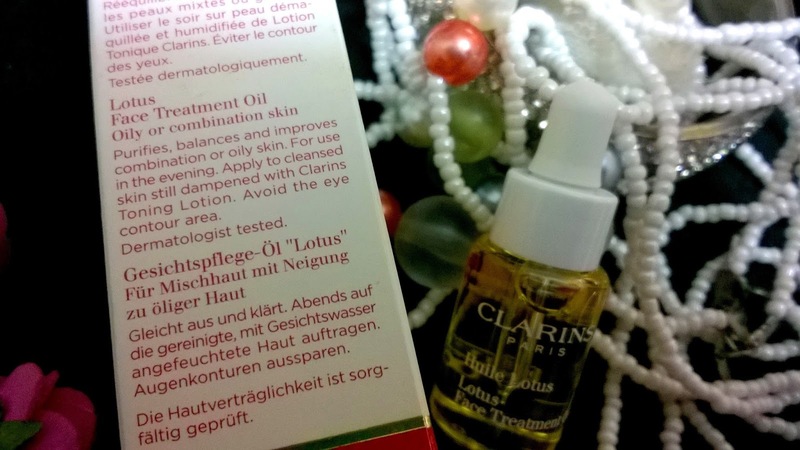 Clarins is one of the best known International beauty brands that aims to provide scientific beauty solutions targeted for specific skin concern, enriched with botanical ingredients. 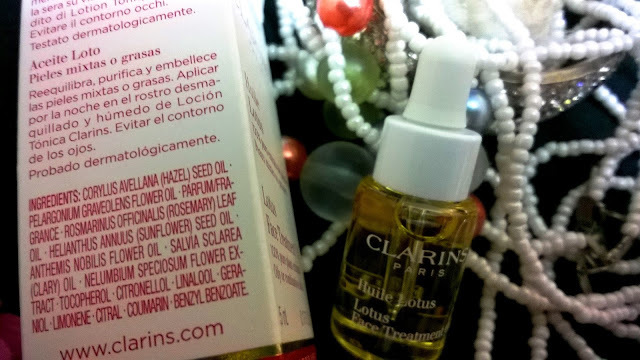 Clarins Lotus Face Treatment Oil for Oily & Combination Skin has Pure essential oils of Rosemary and Geranium along with Lotus extract as its major Ingredients along with Sunflower seed oil, Hazel Seed oil, Vitamin E and some minimal preservatives. Packaging is elegant too and quite travel friendly, although the bottle is made of glass and automatically feels delizate. Claims include purifying and improving oily or combination skin, refining skin and balancing sebum production. Quantity is good enough to last 2-3 months because only 2-3 drops are enough to used for whole face everyday. Clarins Lotus Face Treatment Oil is available online on Amazon as well as offline in Clarins stores for about Rs. 5500. It is a renowned luxury brand and price reflects that. The main thing to see now is if it justifies the steep price tag. When I applied it for the first time, I thought it was a bit too oily for my skin and I was worried that it would increase acne on my cheeks. But it did not. It took me 2-3 days to adjust the amount I was applying on my face and I realized that only 2-3 drops were enough to moisturize my skin as well as keep it hydrated for 5-6 hours easily without making it too oily or too parched. In this sense, it was a good moisturizer for my complicated skin. 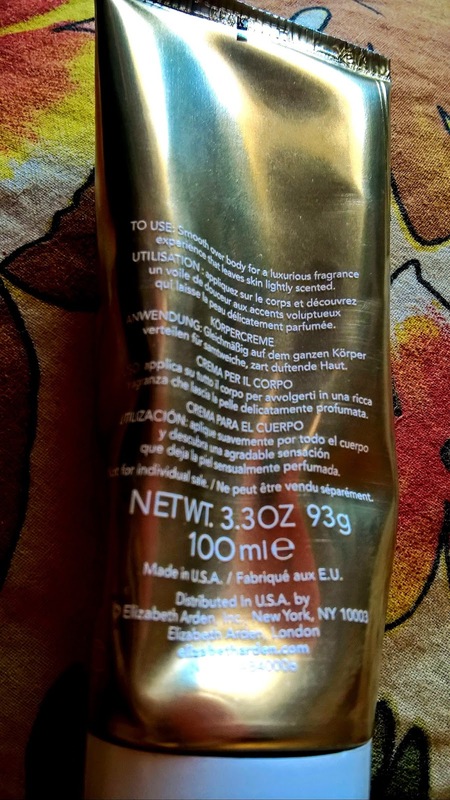 It does not have a very strong fragrance and the mild chemical-y smell we get on applying it dissipates after some time so no issues there also. Overall though,even after using it for almost a month every night before going to bed, I did not see any big changes in my skin which is not what is expected after paying such a huge amount. I would expect that something this expensive would at least even out my tone, brighten my face more noticeably but all it did was give me a glow which I could frankly get from any other much less expensive cream/lotion too!